According to Frank Sinatra,' Love and marriage, love and marriage. Go together like a horse and car... riage. This I tell you... bro... ther. You can't have one without the... o... ther'. Well, that is unless you ever get a chance to marry someone special like my mate Everard did, and manage to create an interstellar comic book about... no. I'm not going to tell you. He will. In the following interview. 1) What are your own origins, Everard? Plus what path did you take in life prior to getting to where you are today? As long as I can remember, I have always been infatuated with drawing. I always tell the story of how I was often scolded in school -- and by my father and my teachers -- for drawing cartoon characters in my school exercise books. Super Friends, Space Ghost, The Hurculoids were some of my favorites. My mother in her wisdom, gave me a gift of a sketch pad and a Flintstone’s coloring book, and instructed me to exercise my creativity in those rather than my school books. Thus began my Graphic Design Career. (True story). In the 1980s, I fell in love with comic books. I collected many of them over the years and was fascinated not only by the fantastic artwork, but the characters and stories that the images brought to life. 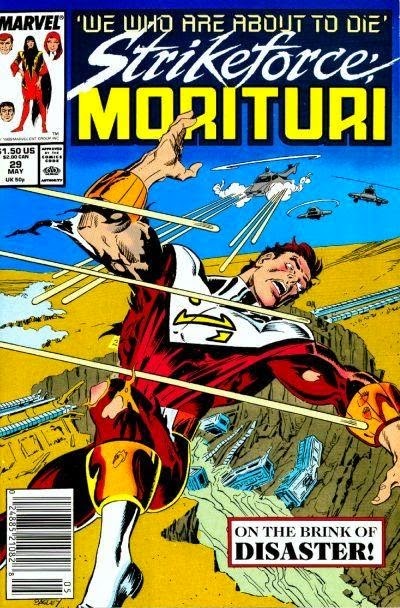 One that comes to mind is 'Strikeforce Morituri' which was created by writer Peter B. Gillis and artist Brent Anderson. I was fascinated by the realism of the character's even though they had special abilities. I thought to myself back then how cool it would be if I could create my own comic book with my own characters and my own story. I did just that. Some very crude drawings. But there were issues and characters and stories and so on. It is at this time the idea of these characters and the story was born. In the imagination of a young boy, the possibilities were infinite, and achievable. 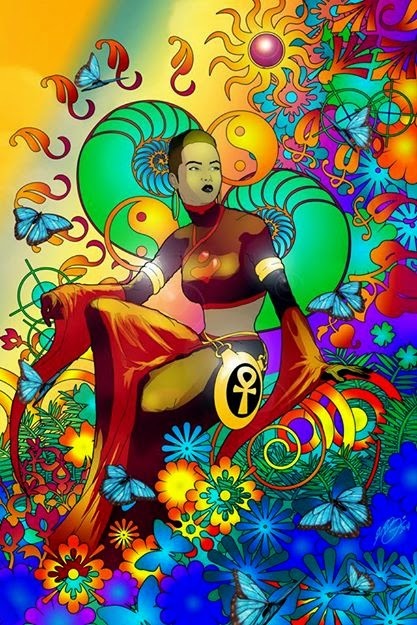 In reality however, the dream of becoming a comic book artist from Trinidad and Tobago and making a living, was just that -- a dream. The means, technology, respect and wherewithal were not available to the comic book artist back then. Comics were little more than a recreational pastime. It was not to be seriously considered as a profession. So the idea was in all practicality shelved and the priority of becoming a Graphic Designer to earn a living took the front burner. Many years and adventures would pass before I would look at creating comic books again. My wife and I currently own our own company named GemGfx, which is a multidisciplinary, design consultancy providing remote design support and free design resources. 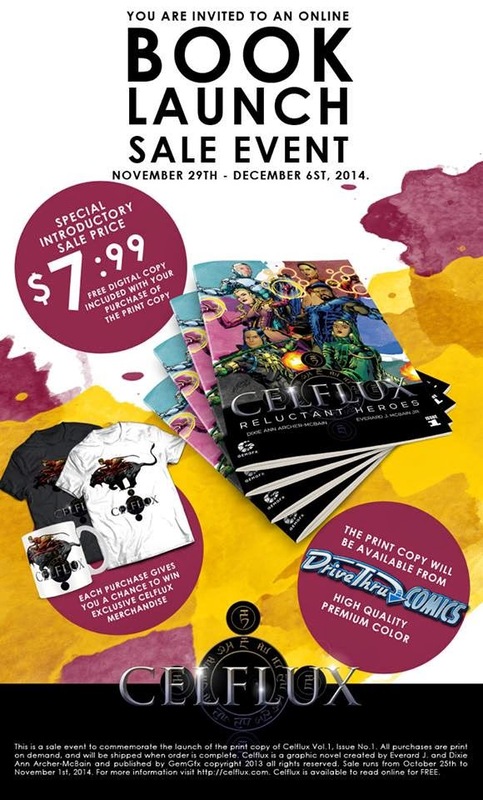 2) What inspired you to create the ‘Celflux’ comic book? In 2013 my wife -- who shares my passion for cartoons and anime -- and I found ourselves watching a lot of it. We would set aside a portion of every day to kick back and relax with a good anime series or movie. I suppose this is what reawakened the comic book creator in me. Those dreams so long laid dormant began to resurface. I once again felt excitement about creating stories and characters. Before long my wife and I were toying with the idea. Things were a lot different now than they were all those years ago. I now had the technology and the means. I mean, most of the tools I used as a graphic designer, I could use to create a comic. Oh, and now we had the internet. I did some research, and I realized that the comic book industry was something of a force to be reckoned with now. I saw the many talented creators as well as the various platforms available for someone who created something and wanted to get it out there. So I knew that it was very possible for us to do the same. So I searched for and found those books that I had created all those years ago with the crude drawings (yes, I still had them) and started working on building characters based off of those early designs. My wife and I did a great deal of brainstorming and worked on the story. We've jumped headlong into it and haven't looked back since. It has all been an exciting experience of learning and discovery. The inspiration for the characters come from aspects of our own personalities and the personalities of people around us. The main character, Okira, is modeled after the strong, benevolent, self sacrificial, female figures that I've had in my life for as long as I can remember. My wife, my mother, and my sister, are all strong black women so I modeled her after them. The other character's I developed their personalities based upon aspects of my own. Not the good aspects either, but the bad. The aspects of my personality that I'm not that proud of. I figured they would be the most interesting parts, and would make for more interesting characters. The inspiration for the story comes from a melting pot of world views, conspiracy theories, philosophy and New Age beliefs. It's set in a fictional world, but can easily mirror our present world in terms of events and the direction our world is headed in. 3) In your own words how would you describe this tale? Celflux is a sci-fi, action adventure, about OKIRA. A young, benevolent, kindhearted priestess who becomes the involuntary leader of a disjointed group of strangers. They wake up one day in a remote lab without any memory of how they got there, or what happened to them. They must begin a journey of trying to find the answers to those questions, and this task is made difficult not only because of the fact that they have conflicting personalities and prejudices, but also because they are relentlessly pursued by a psychotic killer, and a powerful group of rulers with an army. To get the answers they seek, they must endure great loss, and when they do get the answers, they realize that they have to make a choice. A choice that will cost them everything, and whose outcome will determine the fate of their planet. There are many labels that cause a great deal of separation in our world today. To the point that you have human beings on the same planet referring to each other as enemies. This book looks at the real enemy and asks the question: When circumstances warrant it, will a man lay down his life for his enemy? It's easy to lay down your life for your loved one. It may also be easy to lay down your life for an inspirational figure. But is it possible for a man lay down his life for his perceived enemy? This book explores that question and a few others. 4) What song would you say best represents this project and why? Wow! That's a toughie. I can't think of one song in particular, but there is a composer by the name of Valentin Boomes who composes some very epic orchestral type music. One of my favorites is a track of his called MANA. It's a really epic sounding musical score. That's the kind of music I envision for Celflux. 5) If you could get a celebrity – either living or dead – to promote your wares, who would you choose, and why would you want to choose this particular person? 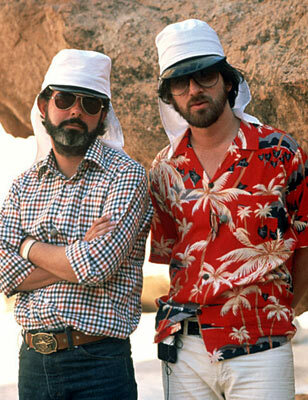 If I could pick more than one, the names would be Steven Spielberg and George Lucas. My reason for this is not just because they're two of the biggest names in the business, but because they both personify to me imagination and dreaming. Both of them were not afraid to pursue their dreams and ideas no matter how far out they seemed to others, and were willing to make the sacrifices necessary to see those dreams come to reality. The result of which have influenced the world and pop culture, in theirs and in many generations to come after them. 6) What have you learnt about yourself through this endeavour? And what was it like to work with your own wife? I've learned that planning, creating, and marketing a comic book -- though much more accessible than when I was growing up -- is still hard, unrewarding work (at least in it's early stages). You can't be in it for the money or for the fame. It has to be about your love for your project, your love for your characters and a desire to tell your story. If your book ever becomes a world renowned success, this mindset is what will take you through to that. If not, you will still feel satisfied, because it was not about the success in the first place, but about your love for your craft. I've learned that I'm not in it for the money at all, but to fulfill that life long dream that I've had since I was a boy. To create my own characters and use them to tell stories. I cannot tell you how blessed I am to have a wife who is not only supportive, but involved in a hands on way in creating Celflux. She's not an artist, but she is a great storyteller. She reads a lot of novels, so she has the ability to spot holes in a plot, and come up with great ideas on how to fill them. She also is able to be very objective when I run ideas by her and can tell me what works and what does not. So yes, it was an amazing experience being able to work on something you love with the person you love. I could not have asked for a better arrangement. 7) During your time in this field, what is the one thing that has kept you in good stead? The love and support of the people around me. Without a doubt I would not be here doing this if I did not have that. 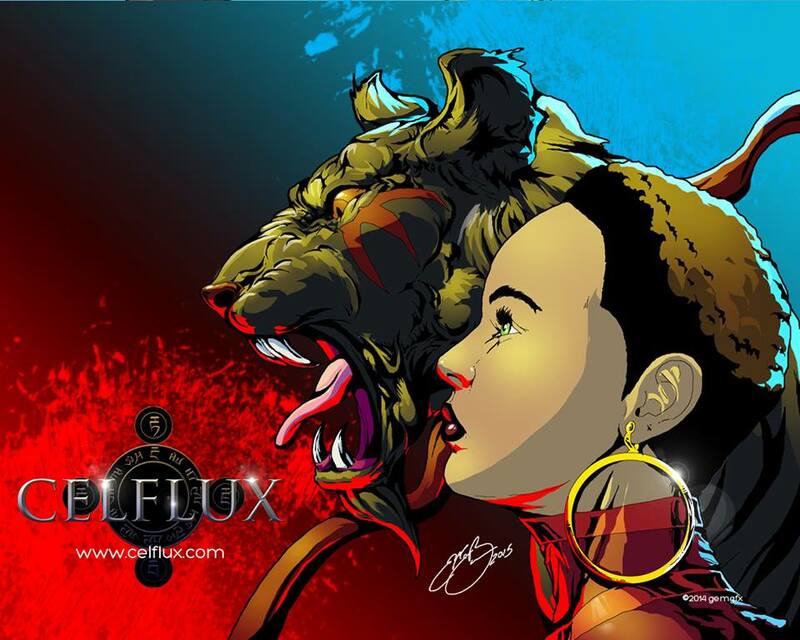 8) If ‘Celflux’ had a motto, what would it be? No victory without sacrifice, and in many cases the sacrifice is the victory. 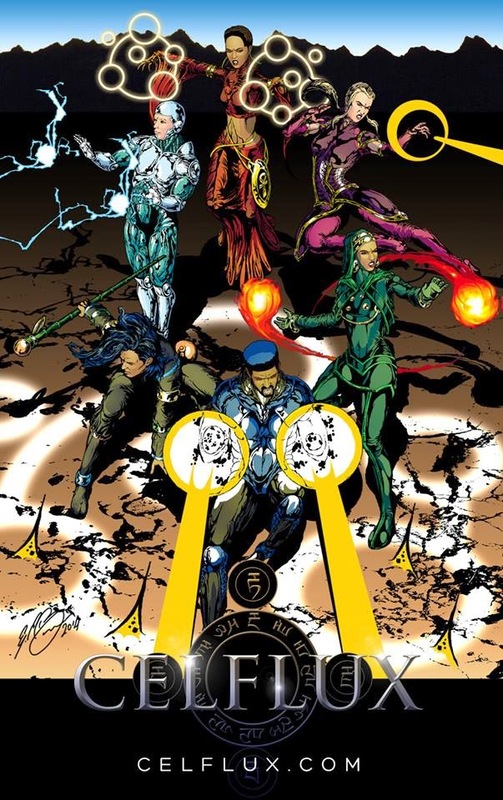 And on that note, dear reader, all I have left to say is please check our Everard's facebook page, twitter stream, and Celflux website for more details on this captivating comic book. Also, you'd might like to know they'll be kicking off a weeks long introductory print-sale and online event, from the 29th of November, 2014, to the 6th of December, 2014.